I look forward to rhubarb in the spring just as much as I look forward to all the berries and stone fruit that will come our way in the summer. It is one of my favorite things to bake with, so a Rhubarb Upside-Down Brown Sugar Cake? Yes, please! This is, my opinion, better (and prettier) than the last rhubarb upside-down cake I made here. The brown sugar in this BCM recipe is in the cake rather than in the fruit topping, which uses regular sugar that I guess you can caramelize to your desired shade of darkness. I left mine pretty light, so it more or less just glazed the fruit and kept it from getting too brown. My rhubarb stalks were more green than red, and I didn’t want to make my cake topping look too murky…I didn’t bother to string the stalks during prep either so I could keep whatever bits of red they did have. The brown sugar cake is really soft and not to sweet. 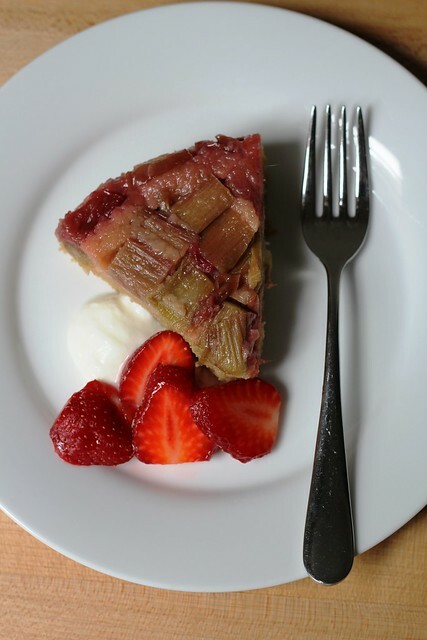 The whole thing together hits the perfect sweet-tart balance…sometimes rhubarb desserts can be too sweet, and I like to be reminded of its snappiness! Before making the rhubarb topping for the cake, Dorie has you macerate the cut pieces in some sugar for a bit. This draws out some liquid from the rhubarb, which I suppose keeps the topping from being too wet when the cake bakes up. Dorie says you can save that sugary rhubarb juice for homemade sodas, but I reduced it until it thickened a bit and then used it as my glaze (rather than jelly) to give the topping extra shine. Upside-down cake makes a great dessert with vanilla ice cream, and also a fabulous morning coffee cake with yogurt and some berries. For the recipe, see Baking Chez Moi by Dorie Greenspan. Don’t forget to check out the rest of the TWD Blogroll! I love that this is not overwhelmingly sweet (often, rhubarb based dessert seem to want to ‘compensate’ for the fruit’s tartness!) – looks great! Reducing the syrup for the glaze is a great idea. I may have to make a note for next time. Mmmm looks delicious! I just love rhubarb! Hi Maggie. Thanks for your comment and for saying my food looks fabulous! I do think this could be made with other fruit, although I haven’t tried myself. I’m guessing that you are clicking on the photos and being redirected to my Flickr site…that’s just a photo database, so you won’t find recipes there. All of my posts with “Tuesdays with Dorie” in the title are part of an online baking group. We are baking all the recipes in a cookbook (“Baking Chez Moi” in this case) and have agreed with the author to not post the recipes. That said if there’s something you know you would make if only you had the recipe, please email me directly at awhiskandaspoon@gmail.com and I’ll see if I can help. What a clever idea to use the syrup as a reduction and then topping! I’m totally keeping that in mind for next time! looks delish, however am not a fan of rhubarb, would you suggest substituting this with some thing else? Hi Roxy! Yes, I’m sure it would work with other fruit. Someone else in the group used pineapple. I love peaches, nectarines or plums on upside-down cake, and cranberries are great, too, when they’re in season. The reduced syrup worked beautifully as a glaze – so shiny and pretty. I didn’t string the stalks either for the same reason. This one is so pretty (even better because your rhubarb is pink!). I loved the cake part and will be making it again for sure with different toppings! Your cake looks perfect! mine needs some work! Your cake is beautiful. I love how nicely you arranged the rhubarb. You answered my question about stringing rhubarb. While I was peeling mine the red color was going away so I stopped. Now I know I don’t have to next time and there will be a next time. This was a lovely cake. 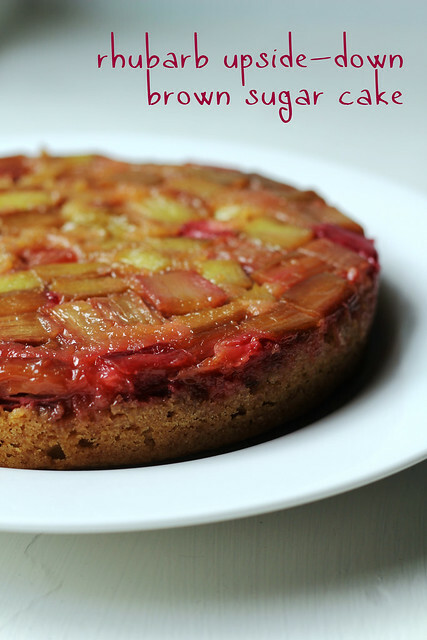 This looks delicious, i’ve only made pineapple upside down cakes so will have to give the rhubarb a go. Your photo has me craving this cake again! Beautifully done! I like the idea of reducing the extra syrup and using that to glaze the cake! Yours turned out beautifully. This is a cake I’ll be making again and again. My neighbor just gave me a bunch of Rhubarb. This sounds like just the recipe for this big bunch. First time to this blog. Love it! This looks amazing. Rhubarb is such a great ingredient to use, such vibrant colours and flavour!